Welcome to Yasodhara Yoga Halifax. We are a developing community of teachers and students who are supporting each other in exploring Swami Radha’s teachings while living at a considerable distance from our spiritual home, the Yasodhara Ashram in Kootenay Bay, British Columbia. We host yoga classes, workshops and satsangs. Class sizes are kept small, and the Yasodhara Yoga practices we offer are gentle, reflective and practical. We welcome people of all ages, abilities and spiritual traditions. 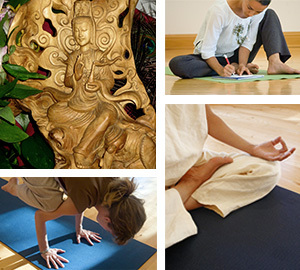 Discover classes in Hidden Language Hatha Yoga, Kundalini Yoga, and Dream Yoga. You may also join us for periodic satsangs. We also host the annual Yasodhara Ashram Eastern Canadian Outreach. These workshops are offered every fall in Halifax. Location: Universalist Unitarian Church, 5500 Inglis St.
What are the messages of your hips and heart? Gentle stretches increase flexibility and wellbeing. Explore poses in depth, through an approach called the Hidden Language of Hatha Yoga that helps you to understand the language of the body and unlock the hidden message of each asana. Open to all levels. Bring a journal, yoga mat & blanket and wear comfortable clothing. Cost: $125 (sliding scale); $220 for both Sat. and Sun. Create a symbolic map of your life and uncover the hidden patterns and reveal your life direction. Through the drawings, accompanied by reflection you will gain access to a deeper understanding of yourself. This process of opening personal symbolism is rich, memorable and life-changing. Bring a journal, yoga mat & blanket and lunch; wear comfortable clothing. Open up a dialogue with your unconscious mind by exploring dreams and waking dreams. You will learn the language of your unconscious and find answers to the compelling questions in your life. This practice will give you the independence and confidence needed to take the next steps in your life. Bring a journal, yoga mat & blanket and lunch; wear comfortable clothing. An evening of devotional call and response chanting and including Aarti, the passing of the Light. Special guests, Swami Matananda of Yasodhara Ashram and Caravan, a Halifax based Bhajan Band.